Category: Books, Ancient Wisdom, Religion and Spirituality Tags: celtic traditions, Danu Forest, insight, meditation, nature, shamanism, solstices, spirituality. 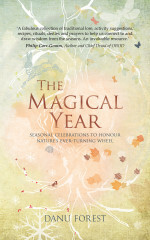 Seasonal celebrations to honour nature’s ever-turning wheel. The Celtic seasonal wheel is based on eight festivals – Winter Solstice, Imbolc, Spring Equinox, Beltane, Summer Solstice, Lughnasadh, Autumn Equinox and Samhain. Together, these lead us through the cycle of the year, aligning our awareness with the seasonal pattern of the earth beneath our feet. In this book on the solstices, equinoxes and other festivals within the sacred cycle, Danu Forest reveals the secrets of each festival in turn and skilfully revives ancient traditions, encouraging us to reconnect with nature, and ourselves, with a host of practical ideas and rituals. Decorate your home with beautiful seasonal crafts and altars to manifest sacred space. Make gifts to give to friends, cast spells for creativity, fertility and blessing, and use the abundance of nature in recipes that can be enjoyed as part of your seasonal celebrations or for self-healing and empowerment. Meditate on the changing heavens throughout the year with Celtic star lore. Deepen your experience of the turning seasons, from the rest and renewal of winter through the revels of spring and summer to the soul or spirit nights of autumn with magical guided visualizations. This cycle of conscious celebration helps us, year on year, to align with nature’s rhythms with greater wonder and insight. Based on sound extensive research, as well as many years of practical experience through both personal practice and teaching, the book will act as a guide for weaving a new, more soulful way of living into readers’ everyday existence.